Who doesn’t love a good cupcake? One may ask how does one improve on the idea of such a delicious sugary treat? You make it more portable by adding it to a jar! 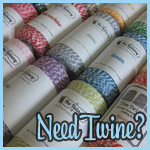 (Plus – you can add a pretty coordinating label or hang tag to match everything else at your wedding reception or special event!) Cupcakes in a Jar couldn’t be more simple and your guests will love the creativity and deliciousness in a portable pretty package. Bake your cupcakes according to the recipe or package directions. Then allow your cupcakes to fully cool and slice them all in half so you have a bunch of bottoms and a bunch of tops. Need a frosting recipe? Here are some highly rated recipes! Now, place the top of the cupcake onto your frosting dollop and gently press it so the frosting spreads/smooshes out. (Make sure when you add frosting in the previous step that you put in enough! When you add the top of the cupcake it needs to smoosh/spreads out enough so that you can see a pretty layer of frosting from the outside of the jar! ) Gently flatten/smash the top of the cupcake so it is more flat and less rounded. This helps when adding frosting in the last step and gives the cupcake in a jar a neat layered look from the outside! Pipe a swirly dollop of frosting on top with your decorative frosting tip (or spoon it in if you are without the bag and tips). Then you can add some pretty colored sprinkles, chopped nuts, sugar crystals…Anything you want that would further customize your cute cupcake favor. When that’s all done screw on the lid and you are ready for the finishing touches! Add a personalized favor label to the lid of the jar or hang a personalized favor tag to the jar when you tie on the wooden spoon. That’s it! 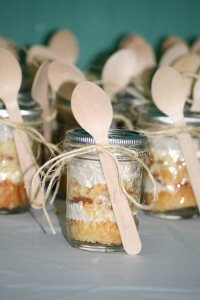 Cupcakes in a Jar are a fun, whimsy (not to mention DELICIOUS) favor idea for your big day. Your guests will be so excited to see their very own cupcake concoction waiting for them at their seat or arranged pretty on a favor table. Some guests may dig in right away (how could they resist?) or they may save it for later when they have danced the night away and want something yummy on their way home. 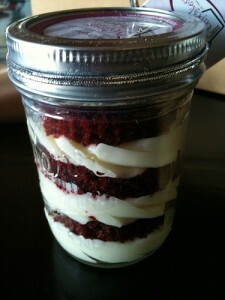 Cupcakes in a Jar are tasty and so easily customized to fit your big day and you both as a couple. They are guaranteed to wow your guests – young and old! 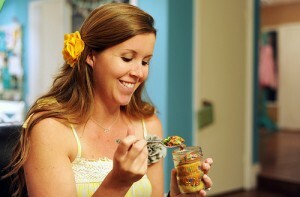 As always if you use our instructions to make up your own jars of deliciousness we want to see pics! 🙂 Keep calm and cupcake in a jar on! 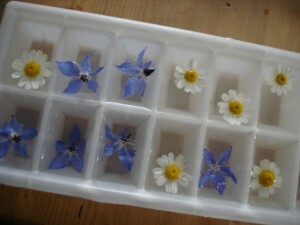 Floral/Flower Ice Cubes would make a great personal detail for your wedding day! 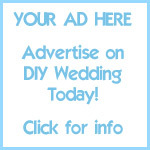 It would be perfect for a spring or summer wedding, especially if your wedding theme is garden related. They are extremely easy and affordable to make, and can be customized more specifically to your wedding theme with your choice of flowers and even food coloring. The cubes can be added to drinks and cocktails (maybe dress up your signature cocktail? ), added to punch and more..be creative! If you are going to color the water for your ice cubes you will want to do this first! This isn’t necessary as the flowers being frozen inside each little cube are more than beautiful enough to stand on their own. Some, however, want to further incorporate their wedding colors into the cubes..and this is one way of doing it! I suggest taking a large plastic container like a gallon milk jug, filling it with water and gradually adding food coloring one drop at a time and shaking the color in until you reach the color you are seeking. You don’t want a lot of color..you still want the flowers beauty to show through in the cube..but a slight hint of pink..green..blue (any color you like!) can be a creative addition to your cube. Next, fill your ice cube trays half way with your water and freeze until firm. Now, add your choice of small edible flower or flower petal to each cube compartment and cover with more water. Freeze again until firm..and they are ready to go! You can either serve them immediately or put them in large zip-loc freezer bags to save until you need them. 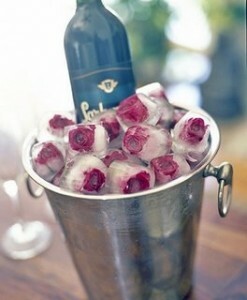 As long as you have the freezer space, these ice cubes are a gorgeous little detail for your wedding reception. There are so many different colors of flowers and food colorings that the possibilities are endless when it comes to coordinating these cubes to your wedding theme. We’d love to hear your your creative combinations for these cubes..and of course if you make them we want to see pics!